In recent years, Rotor Componentes Tecnológicos S.L., has become known worldwide due to the advance and success of its innovative cranks which eliminate the dead-spots. ROTOR's new challenge is to again succeed where many other failed before: ovalized (elliptical) chainrings with variable regulations that can be customized for each rider's needs. We invite you to visit our booths at INTERBIKE (#775 & OUTDOOR DEMO), so you can test Q-Rings and Rotor Cranks for yourself. ROTOR cranks are a unique product in the bicycling community; they really improve the cyclist’s knee health and reduce the heart rate at a given output, because they eliminate the two dead-spots in each pedal rotation enabling cyclists to achieve the same power output at a lower heart rate and without additional strain on the knees or cardio vascular system. All conventional cranks have the two inherent dead-spots in each pedal rotation. 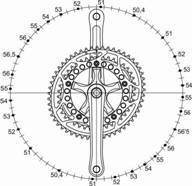 The ROTOR Crank set works by increasing the force required on the drive side crank which propels the non-drive crank past the 12 o'clock point, (this point is referred to as the dead-spot). The cyclist can now "continually push" the cranks as there is no gap between when the legs take over push/pull duties. Pedaling Rotor Cranks feels incredibly smooth even when out of the seat while climbing. Q-Rings are unlike the asymmetric Bio-Pace and O.SYMETRIC chainrings inasmuch as Q’s are symmetrical. The ROTOR patented OCP System (Optimum Chainring Position) enables you to customize the position of the Q-Rings where they best suit your personal needs and desires. Q-chainrings can be installed on most conventional cranks. They are available for most Road (130 & 135 BCD), MTB (104/64 BCD) and Compact (110 BCD) cranks. Q-Rings reduce dead-spot negative effects due to its effective variable gear oval concept. The effective gear is lower at the dead-spot zone, so it is easier, faster and more comfortable (smoother) to pass through it. Once the pedal is over the dead-spot and enters the down stroke, the Q-Rings progressively increase the effective tooth size as more muscle strength is available. As shown in this illustration, a 53T Q-Ring at the dead-spots is equivalent to a 51T, so it is easier to move through the dead-spot. But as the pedal goes down and more strength is available you can see how the gear (effective tooth size) gets bigger: reaching the equivalent chainring tooth size of 56T during the power phase. What’s different between Q-rings and previous non circular chainrings? The Q-Rings are elliptical; the Bio-pace and O.SYMETRIC chainrings are asymmetrical. The specific elliptical shape of the Q’s provide a very smooth uniform pedaling stroke; there is no sudden acceleration movement. The Bio-Pace chainrings are designed so the maximum equivalent tooth size is at the dead-spots. The Q’s have the minimum equivalent tooth size at the dead-spots. This enables you to pass through the dead-spots quicker with less stress to your knees. The Q-Rings take into consideration the forces from your legs in static conditions and the inertias of the cyclist and the bicycle. This maximizes the efficiency and comfort of conventional cranks. The ROTOR patented OCP system enables you to customize the position of the Q-Rings to suit your individual riding habits, body geometry, strength and position on the bike. Visit www.rotorbike.com to read the complete STORY OF NON CIRCULAR CHAINRINGS.